Kayla Williams was a member of the Alabama Crimson Tide from 2012-2015. She was a part of the title-winning Alabama team in 2012 and added four regional championships and two SEC championships over the course of her career. 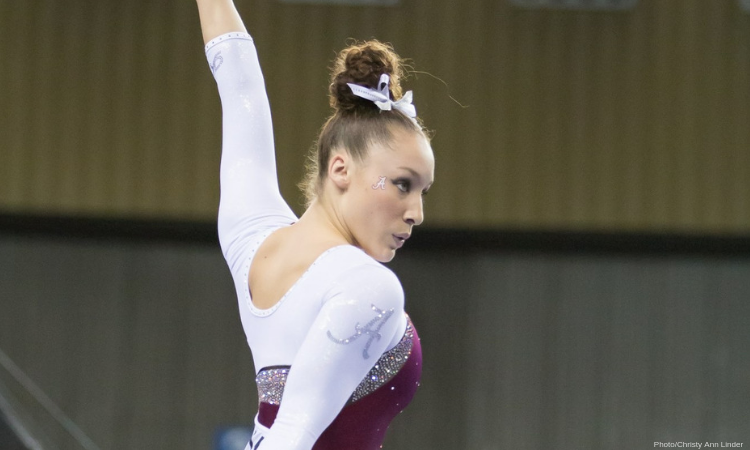 Her individual honors include a regional vault title, four All-American honors and four Scholastic All-American honors. She was also a four-time member of the SEC Academic Honor Roll and was a part of the squad that earned Alabama’s highest team total in program history, a 198.250 that came in the 2014 matchup against Stanford. Before college, Williams was frequently in the top of her field in J.O. competition and made a brief yet bright appearance on the elite scene, qualifying to the international level mere months before being selected for the 2009 worlds team and becoming the first American to win the world vault title. College Gym News: It’s been a little over three years since you left Alabama. 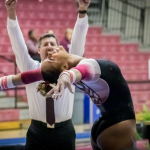 What are you up to now?Kayla Williams: Right now, I am the gymnastics operations coordinator for a sports marketing firm based in Birmingham, Alabama, called Knight Eady. It came about a few years ago—so it hasn’t been around too long—from two friends, David Knight and Michael Eady, who came together to create unique sporting events for athletes of all levels. One of the first things they did was purchase a gymnastics podium. They saw what an impact that had on SEC gymnastics, getting the opportunity to compete on podium and the success that was on the national stage. They wanted to provide that experience to youth gymnasts. They started a competition called Elevate the Stage in 2015, which was actually my senior year at Alabama, so I competed in the first. They started this competition in 2015 and brought Alabama and Auburn to Birmingham to try and get them in front of some new fans in a new facility, and then it just has continued to grow over the years. I started a little over a year ago, and one of the first ventures I got to undertake was to create multiple sites for the event. So we took it to Reno, Nevada, Toledo, Ohio, and Augusta, Georgia. I got to work with a bunch of NCAA programs and a bunch of youth competitors from all over the country and provide that championship experience to them. Since it’s a regular season meet for the college gymnasts, they love it because it gives them that extra feel. And then for the youth competitors—I mean, how many level 6 and 7 gymnasts can ever say that they competed on podium? I love to see them get that experience too. I also work on some operational stuff at the Pac-12 championship and the NCAA championships, so I get to stay very involved in gymnastics on the college and youth level, and working in sports marketing, I get to learn the ins and outs of what it takes to put on an event. CGN: How did you get involved with Elevate? KW: It was just good connections, having good relationships with the University of Alabama and me kind of keeping my ear to the ground on what could be next after graduation. I bounced around a little bit and was helping out in different athletic departments, so I knew I wanted to stay in sports. I stayed in the athletics department just looking for what would be next and what would be stable. That’s how we connected, and I’ve been really lucky that they’ve let me hit the ground running and given me a lot of freedom to grow the event in a way that I think fits our sport. CGN: What’s it like attending a meet from the organizational side of things? Is it similar or different from being a part of the meet as a gymnast? I don’t know anything about how to get that set up. I just know how to get out there and perform. So it was definitely a learning curve in that aspect. But I think it’s very similar in that I still take it very seriously. It still feels like a competition to me; I want everything to go as perfect as it can. I definitely think some signs of frustration probably show on my face when it’s not going right, just as it would if I wobbled or stepped out of bounds or whatever. I think little things like that are probably very similar in that the perfectionism of being a gymnast still shows. But I learned a ton about some of the behind-the-scenes stuff. CGN: How did your time at Alabama prepare you for the challenges that this new role in the sport brings you? KW: Working underneath Sarah Patterson and Dana Duckworth. Those are two mentors of mine that I view as really hard-working, go-getter women that aren’t going to take no for an answer, and I’ve adopted that a little bit in some of the work I get to do, in just not letting anything stop me or slow me down. The way they take care of that program and grow it, and the way they want the program to be better each and every day is the same thing I do with my events. Each and every day I want to do something that makes them a little bit better. CGN: Shifting gears a little bit, your rise to elite success was meteoric but then you left elite to go back to J.O. What brought you to that decision to leave elite after worlds in 2009? KW: Kind of a lot of things, and I don’t know that this story has ever been told correctly? But maybe now we can do that. It really was a very quick rise into elite and a very quick exit at the same time. I don’t feel bad about it at all, but I don’t think on my way into elite I really knew what was going on. I took that level 10 season just like I would any other, and it just so happened that—I didn’t know this—but I was doing much bigger skills and probably performing them at the best of my ability at J.O. nationals, which I guess got me some looks from some national team staff. I was invited to a camp right after that where I had Alicia Sacramone down at the ranch teaching me the Rudi that I ended up competing at worlds a couple months later. But again, I didn’t really notice what was going on. I just went into the gym, I went to camp, I did what I was told to do and it just happened to be a really good year. From there, I qualified elite, competed at Classic, competed in Championships and again, I was just kind of rolling through like I know how to do. I know to get up on the floor and to compete and perform and that’s that. Worlds again was kind of a blur; it all came and went so fast. After that, I continued training with every intention of staying elite and upping my skills on all events and becoming more of an all around gymnast. That was absolutely my plan, but I started having kind of a tough relationship with my club coaches at that time. I really had to take into account the fact that I knew I wanted to do college gymnastics my whole life, and I knew that’s what I wanted to do. I grew up going to Morgantown, West Virginia, near my hometown, watching WVU ever since I was little, and I knew that side of the sport was something I wanted to participate in. When I started getting to a tough place, I knew I had to make a decision: Do I protect my ability to compete in college, or do I continue on this elite path that had so many unknowns? Ultimately, I chose to protect my opportunity to compete in college. I went to Cincinnati where I have family but also knew I could train under Mary Lee Tracy, who welcomed me in with her elite group. I got to continue to train at that level and really prepare myself to compete collegiately, and ultimately I was in Cincinnati when I chose to compete for the University of Alabama, which was an incredible decision for me—just a really good fit and a great family atmosphere that I really needed at that point in time. CGN: That leads into my next question: What led you to choose Alabama? I really appreciated that honesty and just laying it all out on the table kind of thing. That’s why I say that every day I felt like it was a mission to make that university and that program better than when I got there because that’s how it was positioned to me as a recruit. It was a sense of this is what we’re inviting you here to do, and if this isn’t the place for you, then it’s not the place for you; but we want you to come if you do. That honesty and that genuine presentation is really what sold me on Alabama. CGN: What are your goals for the future both personal and professional? KW: Obviously, gymnastics is a huge part of my everyday. I want to continue growing relationships with these youth clubs and create a really great and positive atmosphere for these girls to come compete. There’s been a lot of negativity circulating around our sport, and I know one meet weekend for however many kids that come compete with us probably isn’t the turning point for the sport. But I do think it’s something positive that every single coach and athlete walks out of that arena and loves the sport a little bit more because of it. So that’s definitely a goal of mine—to continue to grow those relationships and create a positive environment for our sport. And then collegiately as well; continue to give them unique opportunities throughout their season and unique interactions. One piece of Elevate the Stage that I really love working on is the philanthropic aspect of it. A lot of times we pair with like local charities or public schools or something of that nature. So continuing to get the gymnasts into the communities, to get some unique pairings and interactions means a lot to me. Personally, I don’t have much there. It’s work all the time! But I love what I do. CGN: Piggybacking off of that, what are your goals or hopes for Elevate as it continues to grow? 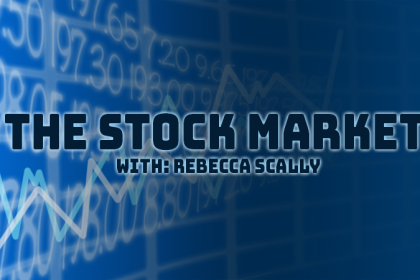 KW: I’d love to see a few more locations that are really stable. Last year we had five different locations. I learned a lot in doing five. This year, we’ll do two, so we’ll be in Toledo and Birmingham. We chose those locations because there are youth teams and competitors that can really get behind those locations. There’s college teams near Toledo. We have a new partnership this year with the Big Ten Conference where we’ll be hosting its Big Five meets. So we’ll have five of its teams on Friday, five on Saturday night and it’ll use those results to seed its conference championship. Getting in locations that youth teams can get to and can support ,and being close to college teams and creating a really great environment for them is important. I’d love to add more places where we can get the podium out to more people. It’s just got to be the right place. I definitely see growth there but haven’t found a new home base yet. I’m working on it. That’s Elevate in its summation, working on events like the Pac-12 conference championship. It’s moving to a neutral site for the first time ever, so there my goal is just be an asset, assist with what I learned in Elevate and working on the NCAA championship—to better that conference and help it with that event. Then the same thing for NCAAs; they’ve chosen to place it in Fort Worth, Texas, for the next four years, getting in the community and providing again what is a super neutral site in a state where NCAA gymnastics can grow tremendously in just letting them see how great and beautiful our sport is. 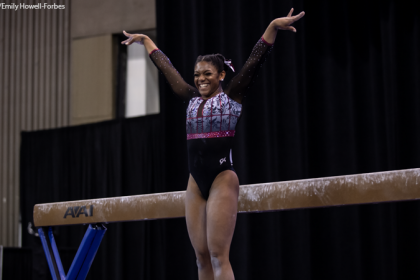 CGN: It’s interesting Texas doesn’t have any D1 teams even though the sport of gymnastics is so prominent there. KW: There’s a great organization, the Collegiate Gymnastics Growth Initiative. It’s a group I try to keep my ear to the ground for and would go to bat for because, like I said, I grew up wanting to compete collegiately. I knew what I wanted next, and I knew I wanted college gymnastics. 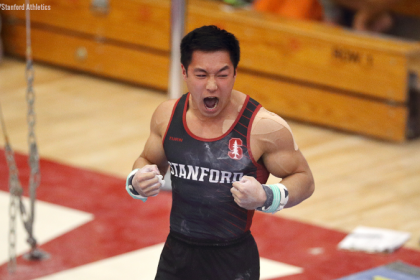 I’m the person that was sitting on the floor watching NCAAs this year in St. Louis, and Peng-Peng Lee dismounts and sticks for a perfect 10.0—I about flipped my chair over I was so excited. I just don’t understand how do people not know about this? Look, I’m skipping Christmas, forget my birthday—college gymnastics is the greatest thing! I was in Fort Worth with people who are just general sports people—like they don’t even know gymnastics—and they came up to me at the end and said, “This is incredible!” So that’s why Elevate is important to me. Again, I don’t think it’s solving the world’s issues, but people get to interface with that and gymnasts get the opportunity to be under that environment—that much, I love. CGN: What advice would you give the most recent graduating class of NCAA gymnasts as they go out into the world? KW: For a lot of gymnasts, so much of it is planned and known and predicted. Then you jump into the real world, and so much is unknown. Embrace the unknown, and be OK with that. Know everything’s not going to be perfect, and it’s not going to be laid out step by step.